"Diet starts Monday!" 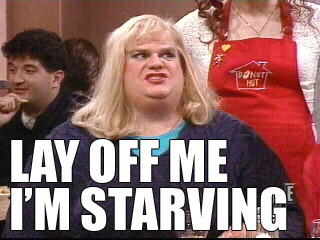 --Chris Farley delivered this line in the hilarious Saturday Night Live skit, "Gap Girls". However, there isn't anything funny about the consequences of holiday binge eating. Many of us are looking for ways to jump start our metabolism and lose that extra weight. Here are three simple suggestions to help burn calories and get the year off to a great start. Exercise with protein supplementation- Add cardio to your daily routine by walking, running or riding a bike and build lean muscle through resistance or weight training and proper intake of protein. Supplement your workouts with a protein drink during the workout and within 45 minutes after the workout. Eat a high protein meal in the early evening and drink a protein shake before you go to bed. Eat small meals throughout the day- Start your day off right with a small meal and eat small meals every 2-3 hours to keep your metabolism from stalling and to prevent binge eating. Avoid refined sugar and flour. In addition to protein, include a variety of high energy foods such as vegetables, fruits, and whole grains. Supplement your diet with metabolic enhancers and appetite suppressants-Several natural supplements are available to increase your bodies ability to metabolize fat. Those may include but are not limited to green tea extract, green coffee bean extract, conjugated linoleic acid (CLA), glucomannan (appetite suppressant), and caffeine. Also, be sure to drink more water. Keeping your body hydrated will allow your liver to metabolize fat at a higher rate. With proper exercise and diet, a boost in your metabolism is easily attainable. Shed that extra weight-gain from the holidays with these easy tips and enjoy a happier, healthier life!